…he also expressed great unhappiness with the fact that my team had not all been paid as much as they wanted. Author’s Note: None of the team members asked for more money, they simply asked to be reimbursed expenses that were agreed upon. At the end of our time working with Ken, we lost over $2,500 in unpaid wages and unreimbursed travel and lodging expenses – all that had been agreed upon ahead of time. Further, Ken always insisted on transferring any funds via Paypal and often making sure that all related Paypal fees and expenses were charged on our end. I considered this conversation irrational and nonsensical once again, and we left the conversation with me saying that if Max was so fixated on the legal work that I had already paid the initial fee for our human rights attorney to write the world citizen legal opinion and that this would be completed on the schedule I had committed to. Author’s note: From what we can gather, there were three people hired to provide “legal” work on this initiative. One is Dr. Curtis Doebbler, who is mentioned in this report. A second person is a Scott Ferguson/Bennet (Grail Poet Productions), an ex-army Psy-Ops guy studying law. 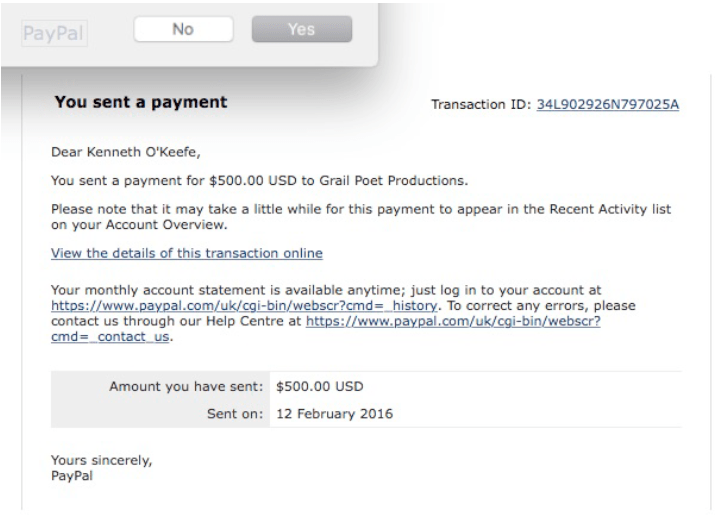 Please see below for a screenshot of a transfer of funds to this man (50% of the total agreed amount). Who is this guy? And why would you pay a law student $1.000 for a legal opinion that he is not in any way qualified to give? The third person is an activist by the name of Chris Coverdale, someone who spent some time in jail for not paying council taxes. Is this the legal “dream team” that Ken has put together?